Tutt, Barbs and I ran the Pretty Muddy 5k race across Bristol Downs to open this month. They both have pictures but they're not sharing, boo. I went to Sheffield to see Jen, for Ben's birthday barbecue. It rained in a torrential fashion, requiring us to stand outside clinging to the gazebo to prevent it flying away, while lightning struck all around. Scary. A very fun weekend, though. I had some singing lessons that I bought at a charity auction last year - just a couple, but it was enough to make me confident enough to sing in front of other people. Eliza was very complimentary about my range, which encouraged me to carry on, but then I had to cancel a session at the end of term due to lack of voice and I never rebooked. The voucher I purchased ran out in June anyway, so I think I was already pushing my luck. I went to the History conference again, this time just as a delegate, which was lovely - like a proper geeky holiday. 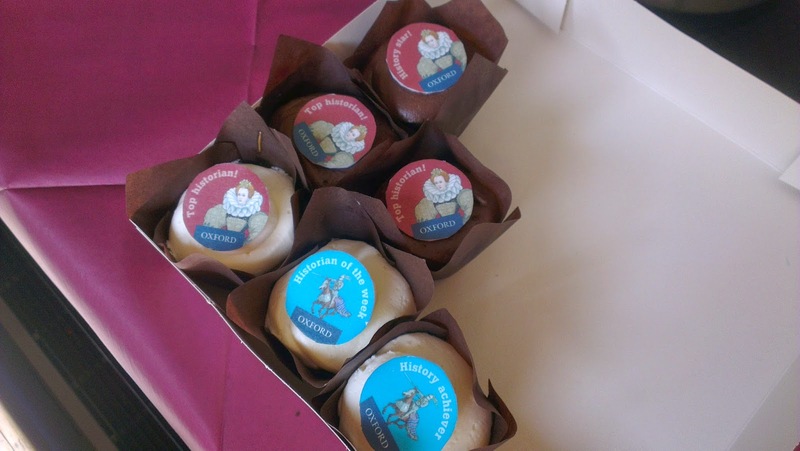 There were even History cupcakes. Then Tutt and I jetted off to Italy. You might have already read something about that. Italy, Italy, Italy. The south, Rome, Tuscany, the northern cities. La dolce vita! What a great way to spend a month, and my birthday. 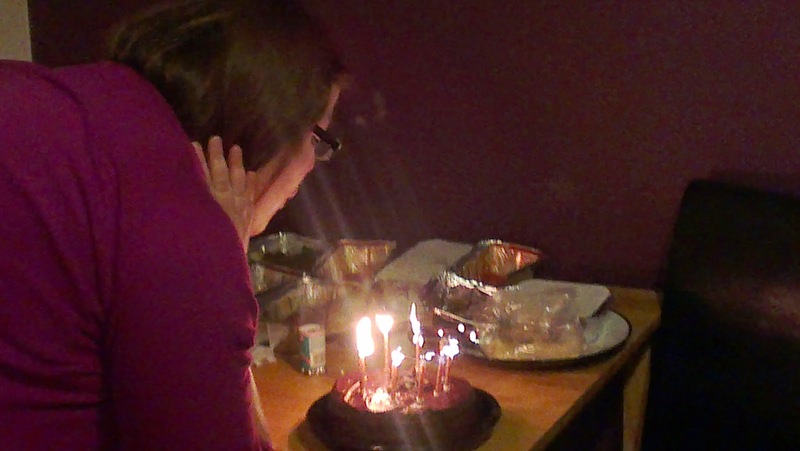 24 again, ho ho. I rounded off the month with a visit to Mother Hand in Portsmouth, who was feeling well enough to be preparing to return to work. We pottered around the old hometown and managed a visit to Scoops, which is a very good ice cream shop that I can highly recommend. We also went on a trip to Hever Castle with my littley bridesmaid Grace, the History geek. It was a really fascinating place - I would christen it, how the Edwardians thought the Tudors lived, with some letters from Winston Churchill thrown in for good measure. 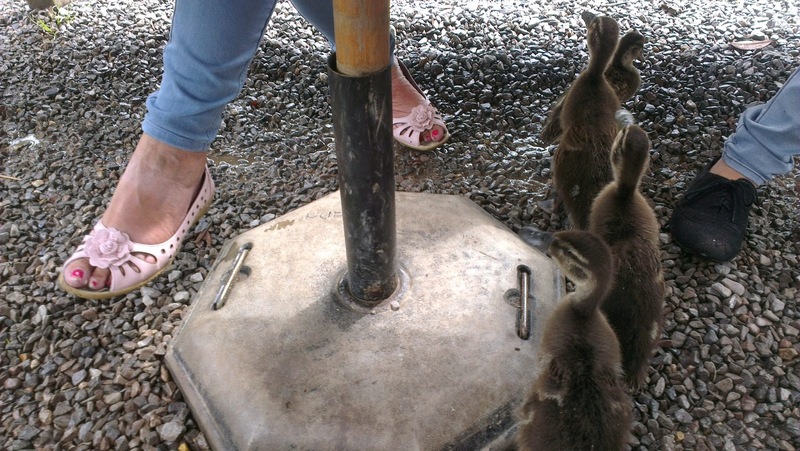 There were also friendly ducks. Whilst in the old hometown I managed to buy a new pair of Ugg boots at the outlet in Gunwharf. They weren't exactly what I wanted but I have lived in them since the weather turned colder so I guess that was a good purchase. Back to school. I had a meeting with the publisher about writing for the new exams. Then I was just really, really busy with work. I felt very overwhelmed. Mr Z and I went to Yakob's 20th wedding anniversary party. I started knitting the hats for my tutor group. 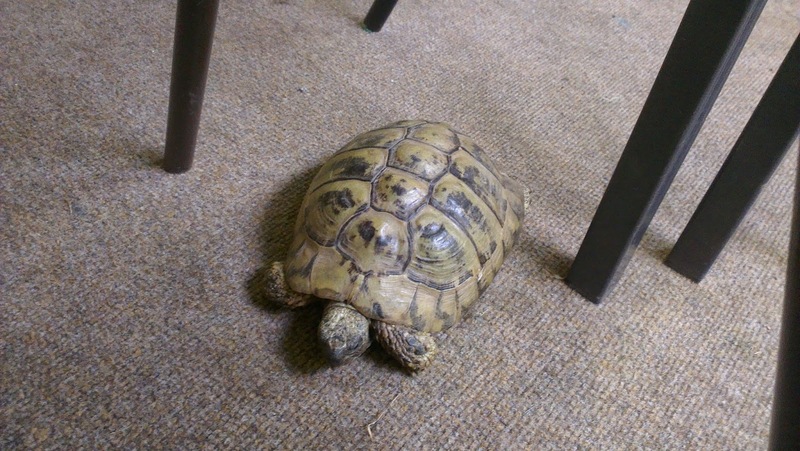 We adopted Norris, a tortoise. He spent the day in my classroom when he was ahnded over to me by Caroline. My students still ask after him. I started attending yoga more regularly, which seemed to help with the busy-ness a bit. More being busy and overwhelmed, although it did improve as the month wore on, and luckily there was half term in this month. I spent most of it in London, staying with Sib, having early family Christmas with Mother Hand as Sib's gone to South America for 6 months, catching up with my friend Sian for a nice Mexican meal, going on an exam board course and seeing Billy Elliott with Tutt, Caroline and Corners. I took the water bus to my course every day, from Putney Pier. It was an amazing way to travel. Excellent views. We also went to see the poppies at the Tower the next day. Probably the busiest day of the year. Also in London, I had a good pamper at the Bliss Spa and with a haircut. I also went to the Natural History museum to get some Christmas cards - I love their Wildlife Photographer of the Year cards. It was really busy, as always. I went back to the Bikram studio in Bristol and started attending their rejuvenating yoga class. It was much more achievable than Bikram. 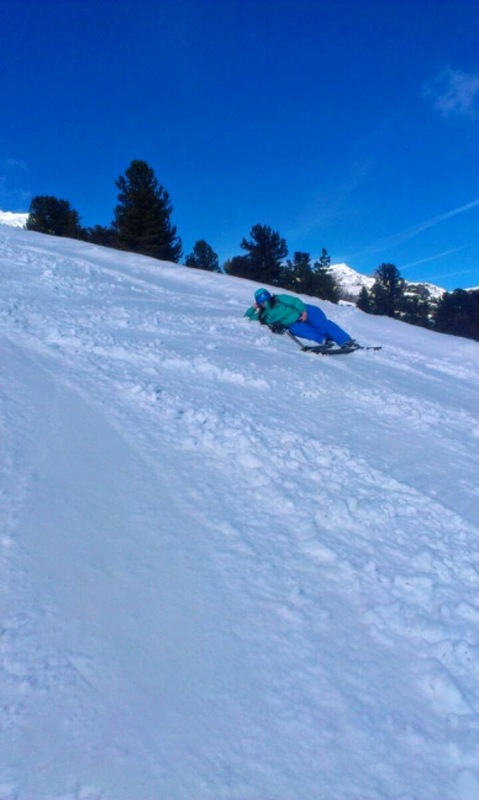 I love it, although I did hurt my neck that first time. I hoped it would be a quiet work term after the busy-ness of term 1, but two of the three departmental audits happened this month, so it was just manic again. I spent most of my time hanging out for the weekend and trying to get to bed earlier. We had a wine-and-Chinese night at Tutt's for her birthday, and started playing the Strictly drinking game...this involves guessing what the overall score will be and then drinking however many fingers you are out. 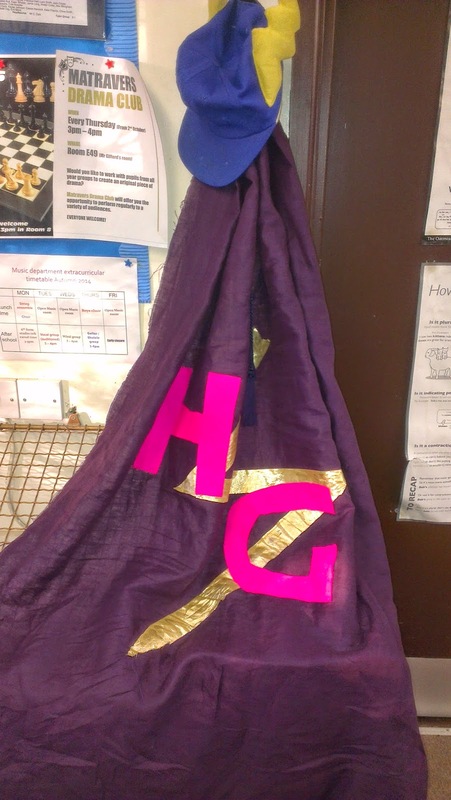 It was Children in Need and I wore a History Girl cape Mr Z put together for me. I realised - I was born to wear a cape. It made me feel more cheerful just putting it on. We went out wine tasting for a leaving do. I went to Sheffield to see Jen and attend a first aid course. I finally booked skiing for New Year with Tom and his friends. 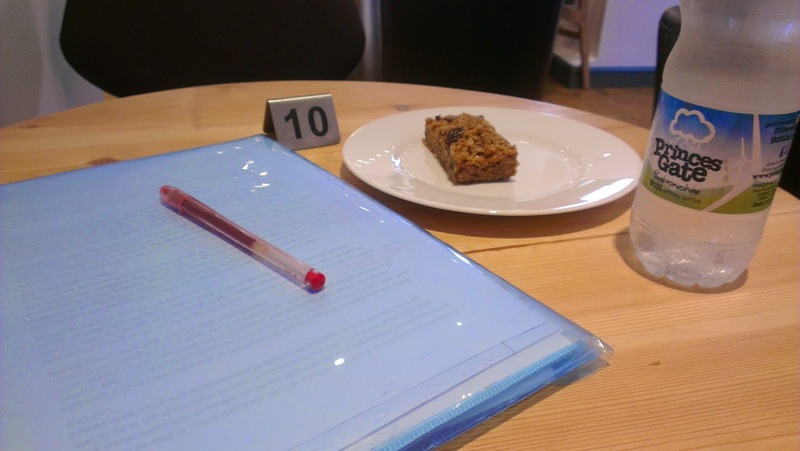 I did a bit more rejuvenating yoga and discovered that taking marking out to a cafe is a much better way of getting it done than sitting and stewing over it at home. Tutt and I watched a lot of Strictly together and drank a lot of Prosecco. We went to the Bristol Cathedral Choir School concert in the Colston Hall, again, which was brilliant, again. I sang in our school staff choir for our Christmas concert - the alto part with Tutt, which was not easy, because the sopranos were singing so loudly. We went out to an Italian restaurant for Tutt's leaving meal, and had a badminton tournament and another meal out after school one night. I'd never played badminton before - it was much more fun than it looks. There's a lot of Tutt in this but then she is my bestie and she is about to move to Essex so I feel like it's about right. I launched a History AGT group at school and a couple of CPD sessions for staff training, and planned a project for an Aspiring Leaders in Education course I am taking. As if I didn't have enough on. 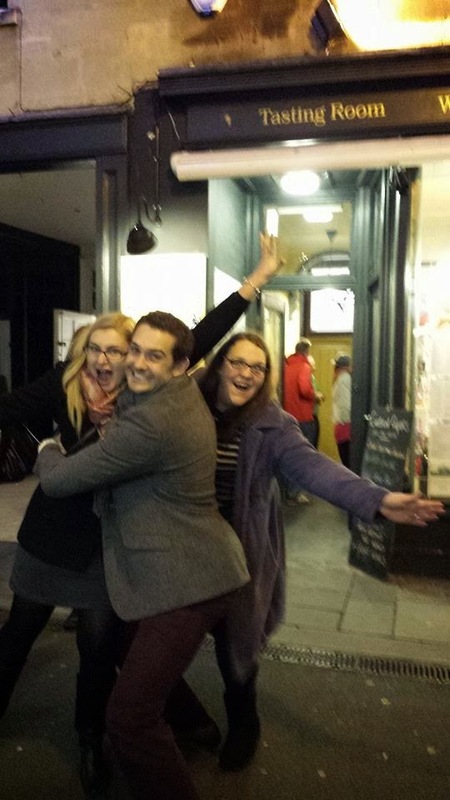 There was a big night out at the end of term, at the Tasting Rooms in Bath (this is the place where we went wine tasting and it is amazing, definitely go there) and then some other places. Then, even though it was the Christmas holidays, there was a fair amount of rushing around. I can't wait for a quiet period. I can't remember much about January. A quick trawl through Facebook reveals that I had book updates due, which explains why I don't remember much. It was a big effort to update them for the new specs, but worth it when I heard one school had ordered 200 copies in the autumn. Good to know my work is being used. 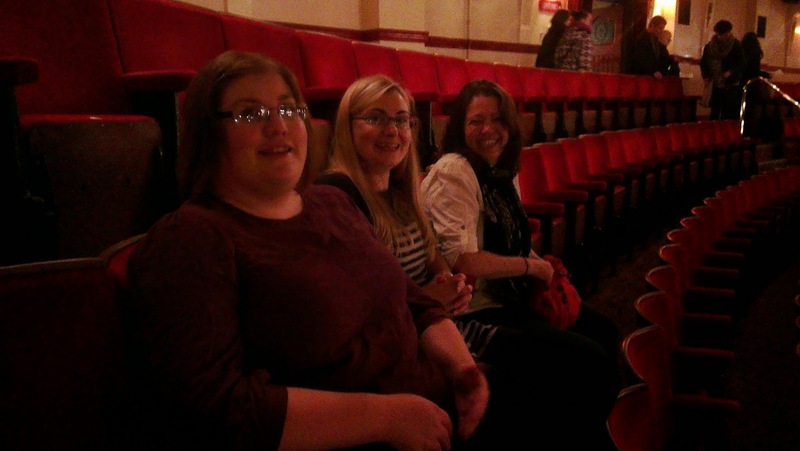 I went to see Brendan Cole with Kath and Parpy Jo at the Hippodrome, which was spectacular - I do love dancing shows and this one was pretty epic. I had a job interview at a very well-to-do private boarding school. I was not sorry when they didn't offer it to me; but, with hindsight, I am a bit disappointed not to be working there. It would have been amazing. Not least because it offered 18 weeks of holiday a year. We went to Sib's and had very late Christmas dinner, and Mr Z played a round of golf with Sib, which did not go well for the latter. I really admire his determination, though. The ladies went for a walk, but it had to be curtailed because I'd managed to rip a shred off the side of the tyre when parking, so we had to get back to the tyre repair man, since my car does not have a spare. Total wipeout. I also get quite emotional thinking about Jenny Jones winning bronze and her parents being there as a surprise. Early in the month I had a nice afternoon of browsing with Vikki round an antiques fair in Devizes, after a school weekend away there. Got some lovely buttons, of course. 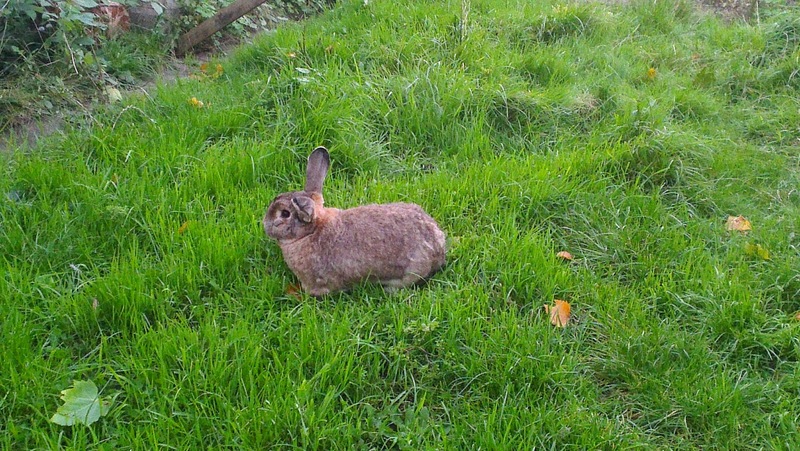 We lost our bunny Nause, sadly. He became ill very quickly and then died suddenly on a Sunday night. I still miss him a lot. I went off and did a couple of rockstar teacher presentations. 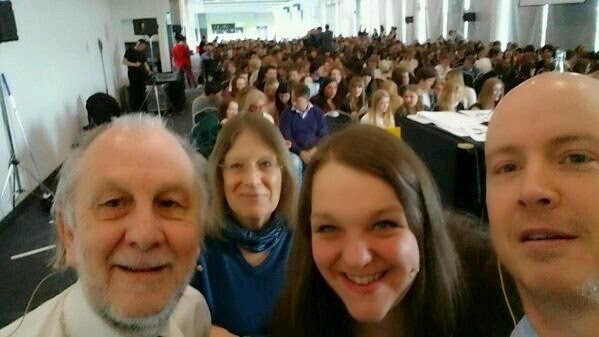 These were very exciting and also overwhelming: the second one was for nearly 1000 students. We accidentally disenfranchised all the accompanying staff by trying to start a hastag; the students, being teenagers, started using to to try and pick each other up. I had two more unsuccessful job interviews, and decided it was probably time to call it quits. I realised I was applying for jobs that were one the same salary as I was on, for way more responsibility. That's just not sensible. Plus, there was an absolutely mental week when I had one of the sessions above and a departmental audit consisting of unannounced lesson observations and a job interview. It was a tough week. I also went to Portsmouth to visit Mother Hand. Mother Hand has not been well this year and this was sort of the start of her coming out of the other side of that. 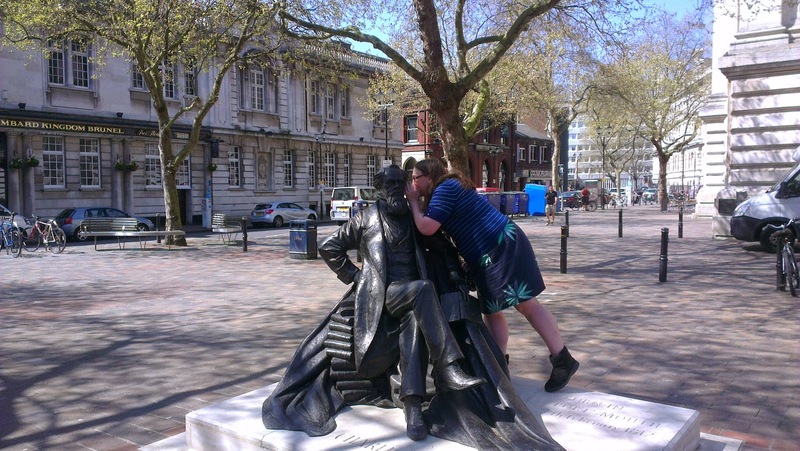 Here I am giving Charles Dickens some ideas for his next novel. I was on a shopping trip with Mother Hand and Grace, my littley bridesmaid who's now in Y13. Makes me feel ancient! I bought he a tablet to help her with her studies. Tutt and I started playing squash on a weekly basis. This was incredibly frustrating to begin with but we did get better as the weeks went on. Also, in this month, I started to get my nails shellac'd every two weeks. I thought a few rounds of it would totally kill my nails but it doesn't seem to have had too negative an impact on them. May was a blinked-and-missed-it. Early May is always full of marking coursework, and this time half term was consumed with exam board work, because, for the first time I can remember, our exam was before half term. Both of them were, actually, which meant that all my exam duties were done by that half term. I was sort of pleased to have half term to do my exam board duties, because the bulk of my work now happens in the first week; but then it got to half term and I realised how urgently I needed a break. Oh well. I did go on a wander around Farleigh Hungerford Castle with Tutt. It was a site visit for a school trip, but I think it still counts as a leisure activity. June was a bit more interesting. It was still crammed full of exam board work, of course - and that work is getting harder and harder; I think fewer teachers are willing to sign up to examine now because the dya-to-day job is so much harder than it used to be. However, there was also the Murder Mystery weekend (this year: Most Haunted) and Tutt and I went off to EdFest for the weekend again, which was fun. Gove got heavily heckled after turning up nearly two hours late. I'd never seen him look so flustered; it was less surprising when he was reshuffled, because of this, somehow. I sort of thought he might have just discovered he was headed for the whip job before he came to speak. His heart did not seem to be in charming us. This the view from the breakfast table in our chalet. I'm having a duvet day today - my first since breaking up - and so I had a bit longer to enjoy it. 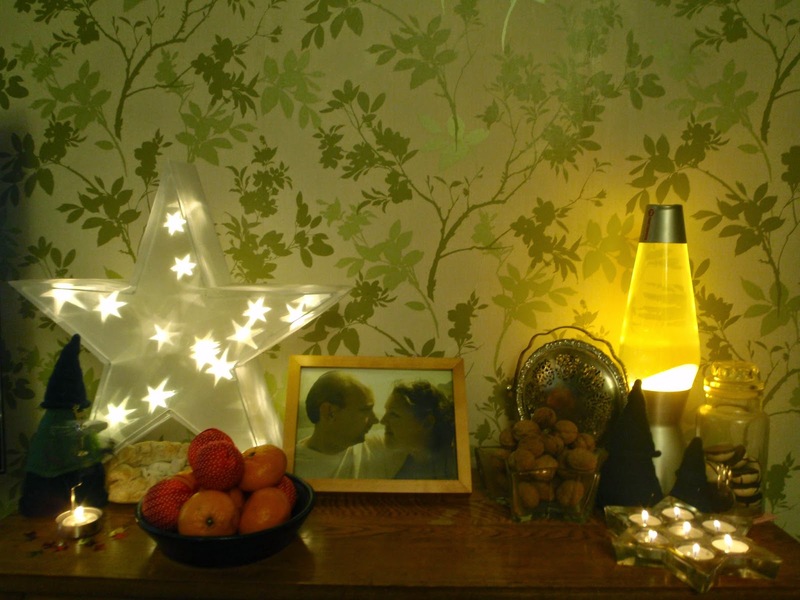 Have a lovely NYE all, and here's to a super 2015! 1. A new water bottle from Tutt, to replace the one I lost when we went to EdFest together. 2. Also from Tutt, a good bottle of wine, a little hanging plaque about friends being like stars (always there even when unseen) and a packet of blue spot squash balls. Now just need someone to play squash with. 3. A yoga mat, from Mother Hand. Bye bye, other people's sweat. 4. A Kenwood slicing attachment, also from Mother Hand. Now I won't have to coerce Mr Z into chopping all my salad vegetables for me. 5. A new hair dryer, from Mr Z. It was the one from my list - well done Mr Z. My old hair dryer is still just about OK, but it does get very hot and smell a bit funny sometimes, so it will be a relief to be able to dry my hair without worrying that it's going to start shooting flames out of itself. 6. A new duvet, from the Parents Z. It says on it, "The duvet for people who like to be warm in bed." That's a Ronseal bit of labelling if every I've heard one. 7. Also from the Parents Z, a Hummingbird Bakery cupcake kit, complete with papers, a cake stand and some stencils for adding pretty images o the tops of my cakes. Can't wait to break that out in the new year. 8. Secret Santa accidentally brought me two gifts this year - an industrial bird feeder to thwart the squirrel at work, which I thought was a great match, but turned out to be not for me; the other thing was a very chic stripey mug with some beauty products in it, which is lovely but won't assist me in the squirrel thwarting. Still, it will allow me to look more stylish when drinking my morning coffee. 9. A good stocking present from Mother Hand - a pack of information cards about all the English monarchs. Going to be very helpful at school next year. 10. It wasn't actually for me, but Mother Hand bought Mr Z a onesie. A Rudolph one. In a way this is a present for me. A great haul this year. I hope Santa brought you everything you wanted, too! Brrrrr! Very cold, but very pretty. Having fun! 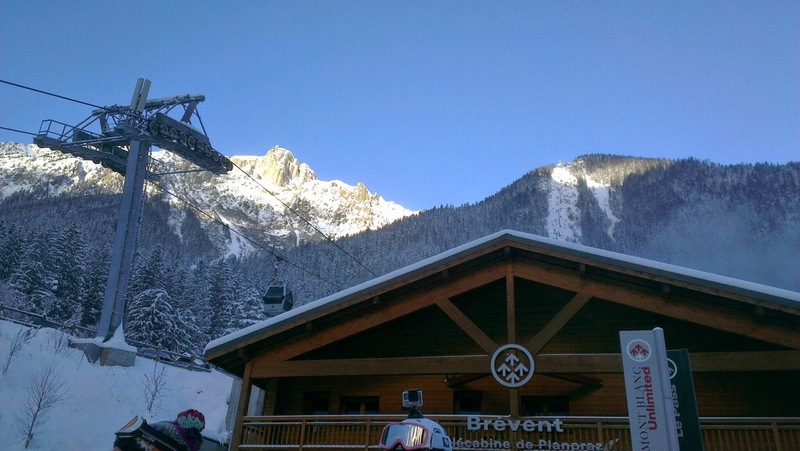 Skiing here in Brevent today. Yesterday was La Tour (I think). Had my first tartiflette of the season, too. Hoping today might be a bot warmer - actually having to wear thermals, shocking. My resolution last year was to finish 12 garments. I forgot I had so many hats to knit. I also toyed with the idea of knitting a certain amount of yarn; I believe my original estimate was in double figures, but I managed about 6km, according to Ravelry's built-in calculator. Not TOO bad but I definitely brought in more than 6km. Finish these items that have been languishing, almost finished, for a very long time. Finish knitting the roses for my rose chair. I also want to do some more motifs for my Lion and Lamb blanket, but how many, I am not sure. Knit something from the yarn I bought at Jimmy Beans in 2013. 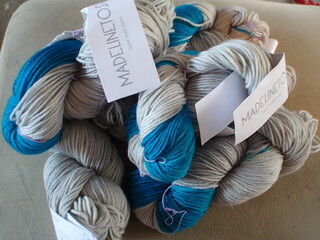 I'm thinking a top-down, V neck, plain vanilla sweater out of this gorgeous Madelinetosh. 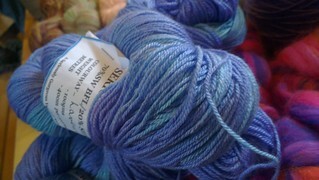 Having spent some time on Ravelry looking at how it knits up, I can't wait. Knit something from the yarn I bought at Wonderwool. This stash enrichment coincided with my purchase of Alice Starmore's Tudor Roses so I have my eye on one of the patterns in there - probably Elizabeth, which is a fairly straightforward 4-ply sweater that I plan to knit in this. Knit a pair of socks. I have managed a pair of socks annually for the past three years, so let this year be no different. Finish knitting the Lopi shell I have been planning for years and cast on in the middle of all the hats. This is very chunky and should be a quick knit, but I do have to actually sit down and knit the thing. Do something about my delinquent UFOs. I have 10 WIPs in hibernation - the time has come for them to be finished, or binned. Officially that is one a month. We'll see. I think that is probably enough. I have many other ambitions but I don't want to be too....ambitious. I blog from the plush blue comfort of my SNCF couchette, on the sleeper train from Paris Austerlitz to ... Er, well, I get off at the last stop (I think it has Germain in it) and change to Chamonix. I will be honest - the journey did not begin well. I am so fatigued from work still that I didn't really want to leave the house, even. Then trains into Paddington were delayed and cancelled thanks to overrunning engineering works, so I left in a hurry, an hour early; squeezed onto a diverted train from Penzance and stood, squashed and moody, all the way to Reading, where the crowds blessedly thinned. After that, it improved. How pretty St Pancras is with its Christmas lights and its brick arches! How easy the Eurostar is - London-Paris took slightly less time than Bristol-London today, embarrassingly. Then, the bit I had worried about most: the transfer from Paris Nord to Paris Austerlitz, which I hadn't noticed until Tutt pointed it out on Christmas Eve. I had 69 minutes. Some websites said 2 hours were necessary but I made it from carriage to carriage in 34 minutes, including buying a Metro ticket and picking up my ongoing tickets from Austerlitz. Then it took 30 minutes of queuing to get on the train, but, meh. It was hardly going to leave without me. And here I lie, in the cramped quarters of couchette 34, with two Welsh girls above and three French folks in the other bunks. There's a pillow, a quilt and a bottle of water. Unfortunately there's also less than a handspan between my propped-up head and the bunk above, but oh well. Who needs to swing a cat, anyway? And there's definitely no room to mark that coursework I brought with me, hurrah. It's a very exciting adventure, eating my turkey sandwich propped up on one elbow and watching the lights of France slide past the window. Quite glad I came, now. I managed this in just three days! I am quite proud of myself. I thought when I reached the border, I would have to stop because it was 445 stitches, and quite daunting. But I powered through and even managed to keep my lace pattern straight whilst chatting to my cousins all afternoon. 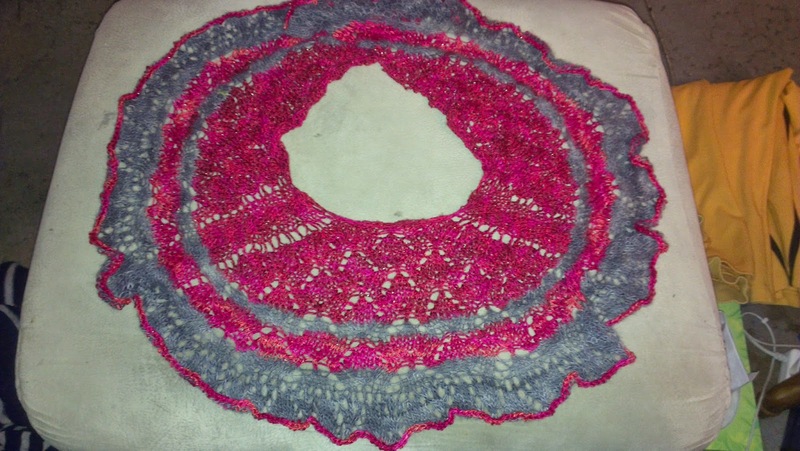 This is the Every Which Way shawl kit from Artyarns, in Firestorm. I knit it exactly as it said on the pattern. I didn't run out of yarn, even though I didn't measure gauge, which was a relief. It needs a good blocking, but I want to get one of those colour catcher sheets first because, having read other people's project notes, the red bleeds quite significantly. It did dye my hand red whilst I was knitting with it, so this does not bode well for blocking. Having looked at that picture, too, I see there is a mistake in the chart. I only have one grey stripe and then the border, whereas there should be a second grey stripe in there. The written instructions have it right but it's wrong on the chat. I still love it, though. Also, having sneaked this in under the 2014 wire, I've now made it past 6km of yarn knitted up this year. Hurrah! 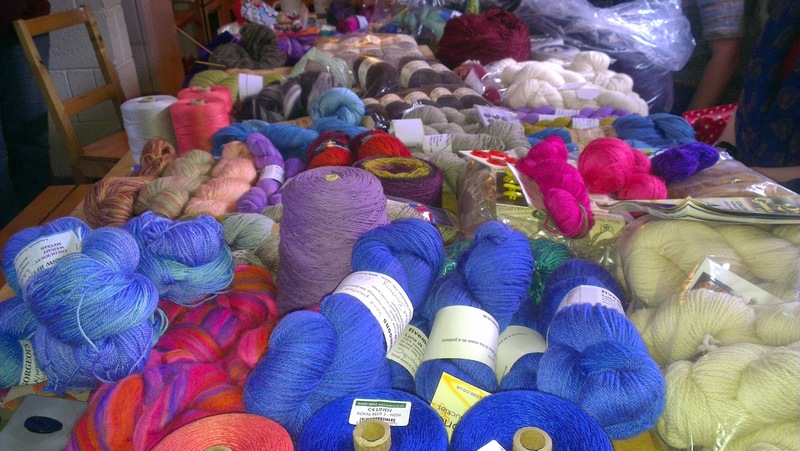 I wish it was all from stash, but then, I would have to stop buying yarn to achieve that dream. We had a big family party at the weekend for my gran's 90th birthday, which meant all the antipodean wing of the family flew in for the weekend. Here we all are - cousins and spouses. The only people missing are Father Hand and Sib. I must admit to struggling a bit with my local cousins, who live within a few hours of home. They are nice enough people, but they are sports mad....well, football mad, specifically. I always say I don't like sport but what I really mean is, I don't like football. This makes it awkward to find things to talk about. Pete and Michelle, however, who both live on the other side of the world, are significantly less into sport than the others. They drove up for a visit today which made for a really lovely afternoon, catching up on Pete's adventures in ballroom dancing and Michelle's recent visit to a lion sanctuary in Zambia. I love having cousin catch up - today's Fave Friday is in honour of that. So, according to the very clever tool on Ravelry, this year I have knitted 5,916 metres in 29 projects. I organised these projects by tagging them 2014 and creating a new tab in my projects which picks this tag up. I am not sure how long they've been doing the metreage thing but I love it, even if it does mean I have become overly fastidious about working out how much yarn I have used for a project. I love them all. Several of the yarns had been in my stash for an embarrassingly long time: I think the winner was probably the v-neck jumper - I bought that yarn at Ravelry day in Coventry which must have been 2009. The brown jumper and the turbanesque hat represent a bit more stash from Wonderwool 2013 used up which, along with the tunic top I started in the silk/linen, means I've knitted up five of the eight projects I had planned with the yarn from that year. Not too shabby. The Oud tank represents my sole efforts with the 2014 Wonderwool stash - one out of ten. Shabby. Must do better next year. I am very pleased to have finished the black lace scarf (never again) and finally have knitted, and made a success of, the barber pole pattern, which I have been lusting after for such a long time. Unfortunately this garment didn't make it into my suitcase for Italy so it hasn't had much wear so far, but hopefully next summer will be a warm one. And, of course, I am so pleased with the hats! Quite proud of myself. I do enjoy knitting them, I did bust some stash (two skeins), a learned to love making pom poms, and it is nice to have such an appreciative audience; but I'm glad I don't have to do it again now for a while. I only have 5 rows left on my Artyarns shawl kit, too...they are massive rows now, though, for the ruffle, and for some reason the final instructions aren't charted which is off-putting. But, I reckon if I can get it finished before the end of the year, it will push me over the 6km mark. That's a good incentive. We had a great day, in which Mr Z wore his new onesie to his parents and got much too hot, but amused everybody, and I managed to Skype with Sib in Bolivia and Father Hand in Vegas, and watched Downton Abbey and Call the Midwife (both new to me) with Mother Hand, and ate All The Cheese. It has felt very Christmassy and I have done a lot of sitting around and knitting, which is always a good day in my book. Festive blessings, all! We booked tickets for the Vatican museum online and, after striding purposefully for the best part of an hour to get there, I just about made it to the booth in time to pick them up. It was definitely worth seeing, but it's a bit overwhelming. There's just so much art crammed into the space. I'm not sure how I feel about that. I know the Catholic Church claims they are saving it so that it is always available for everybody to see. Noble. My favourite bit was definitely the maps room. I also liked the tapestries; and I spent quite a lot of time taking pictures of various details of the building. I felt quite inspired by it all, really. These tapestries are centuries old. The Sistine Chapel was amazing but full of selfish tourists, taking pictures and chattering with their friends despite regular announcements instructing them not to. A woman tried to push me off a bench, claiming she was saving the eat for her boyfriend. Still, once I got the headset working for the audio tour, I managed to tune them all out to listen to the description of the pictures. 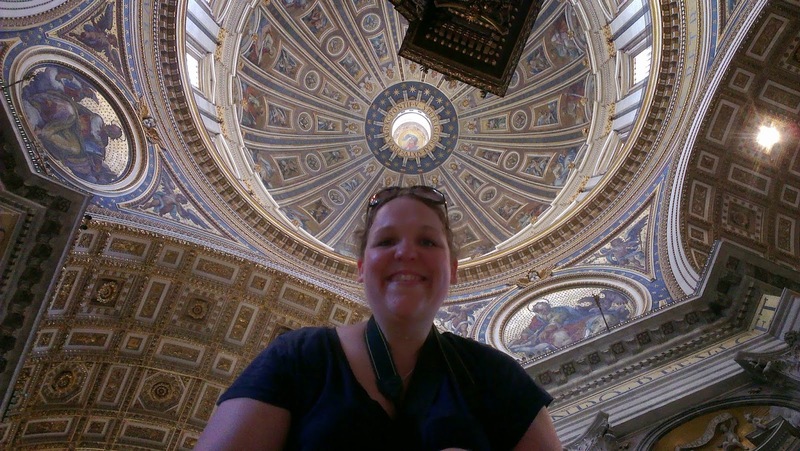 St Peter's was pretty impressive, too. Just a massive, massive space. We were too late to get the lift to the top for the views, so that will go on the list for next time, too. 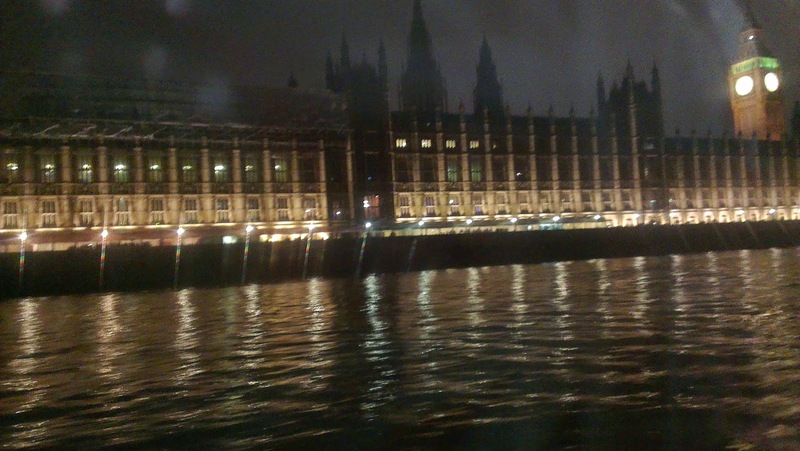 After St Peter's we walked across the bridge and found somewhere nice to eat dinner. 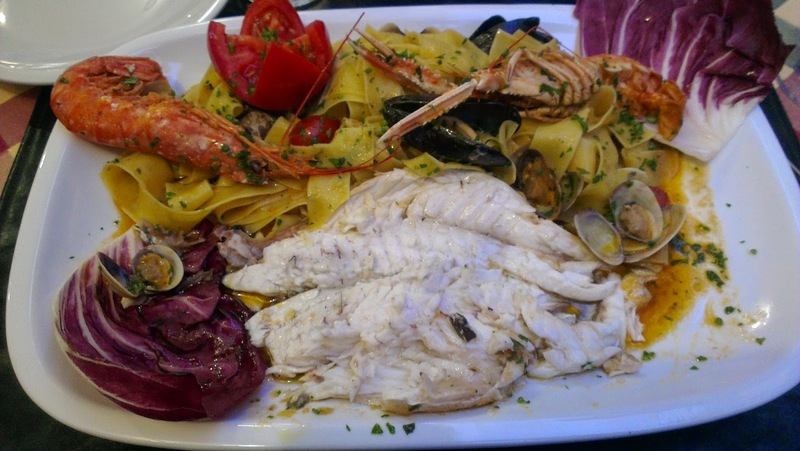 I was charged a small fortune for an off-menu dish but it was really good food. 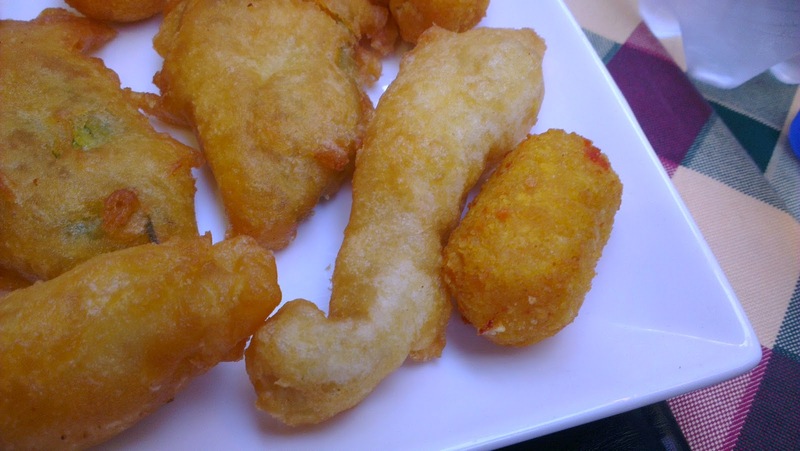 We had fried antipasti in the Rome style, including courgette flowers and a chicken goujon that looked a lot like Italy. A great day, day 2. (Spot the join...phone couldn't quite cope). 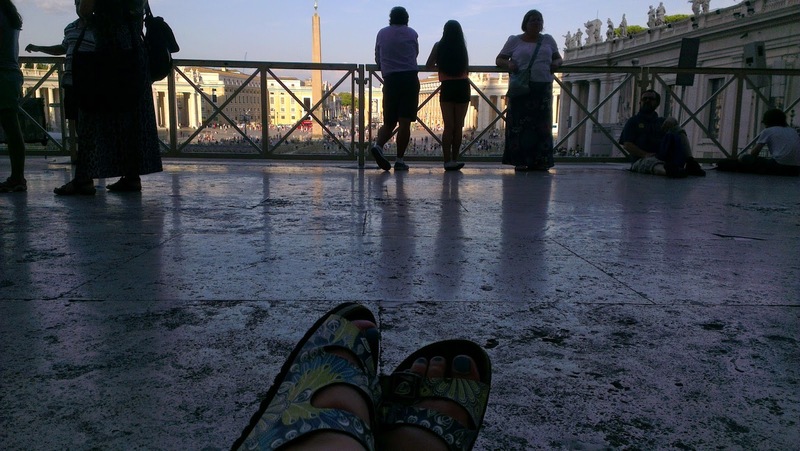 After marching around Rome in the blazing August heat on the Wednesday, Tutt wasn't feeling too clever and, in any case, she didn't fancy coming to the stadium with me, so off I trotted in my taxi to the Foro Italico. The Foro Italico wasn't mentioned in our guidebook (which admittedly was a whole-of-Italy edition) but it was recommended as a good place to visit by a knowledgeable friend and, upon perusing the map, it was just a short yomp down the hill from the hotel, so off I trundled - at midday, of course. I was surprised, upon walking in, not to be challenged or sold a ticket by the desk people, whom I greeted as I passed them, but the Foro itself is essentially a running track adjacent to a large stadium, surrounded by statues. During my sojourn I saw a few people taking pictures, a little girl practising on her roller blades, an old geezer jogging, a slightly younger version running the stairs, and somebody walking their dog - so I guess it is just used as an outdoor space for all comers. I resisted the urge to do a lap, envisioning either embarrassing collapse at 32 degrees or, at the very least, a sweaty and dishevelled figure to meet with Tutt for the Vatican. Instead, I busied myself with photographs of the statues. They did not disappoint. The Foro was built by Mussolini for the 1944 Olympics which never happened here, and because Mussolini loved sport and was obsessed with the cult of Romanita, the stadium is surrounded by statues in style of ancient Rome doing modern sports. For example there is a naked skier, a naked footballer, a cricketer with a hockey stick and a tennis player in a jock strap. The effect is ever so slightly bizarre. Note: naked skiing is not to be encouraged. I walked around for a bit and took a picture for some lads who wanted the brand new stadium in the background; it slowly dawned on me that that's the national stadium, or where Roma play, or something. I wanted to go and look around: I'd heard there were some good mosaics; but I couldn't find a way in. Eventually I walked back through the almost-deserted building (the guard at the front looked very surprised to see me appearing from the back) and out the front, where I saw some excellent Fascist monuments and, yes, black and white mosaics commemorating Mussolini and epic achievements of Italy. I squeezed through the barrier for a closer look. Love this style. It's all very Stalin-propaganda, Empire-State-Building esque. Tanks and planes, immortalised in mosaic form! This is a very history teacher thing, I know, but I was absolutely enthralled. There are plaques all around commemorating the key events of Mussolini's regime, including some blank ones that were erected but not filled before his demise. I love it! Unfortunately it's not very well-kept; I wonder if it's a bit embarrassing for the Italians, but, because Rome is the eternal city, they can hardly remove bits of its history because they find it unpalatable. I expect a lot of people found the Roman emperors unpalatable before there were almost two millennia between us and them. So, I wonder if they're just sort of letting it go to seed, as it were. This is a good little spot for history buffs. Next up: the Vatican. It gets a post of its own. There are already so many pictures in this post.